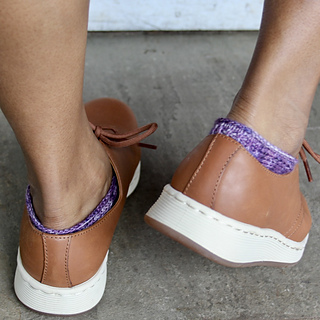 These whimsical socks are knit in one piece from the ankle down with no seaming. The elegant construction allows you to try them on as you go to determine a precise fit for your foot. Even though they are especially low socks, the unique ankle shaping keeps them from slipping down over your heel. They look great peeking out from under clogs or the slits in low boots, or just on their own around the house! Readjust needles: The 15 (17) stitches in twisted rib between the markers are “heel stitches”; the remaining 45 (53) stitches are “ankle stitches.” Put the heel stitches on a single DPN; put the ankle stitches on a circular needle.